Aquariaz is an aquatic paradise located in Avoriaz featuring natural tropical vegetation in mountain surrounding. 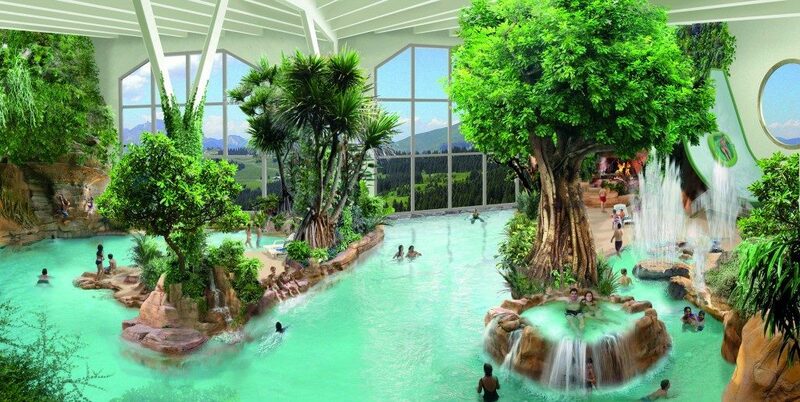 With easy access from Morzine this indoor water park has something for all ages and features a river with a variable gentle current, a slidewinder (a kind of aquatic halfpipe), a water playhouse, a paddling pool, a large pool with climbing walls, massage benches and the must-try: an open-air spa heated to 34 degrees! Aquariaz is open every day from Sunday 8th July until Friday 31st August, 10.30 am – 7.30 pm. From Morzine you need to catch the A bus to Prodains where you will take the Prodains Cable Car (included with your MultiPass) or €6.90 return per adult / €5.70 per child. Once you get off the cable car Aquariaz is only a short walk away.